If you never sell stuffs online, the strategy described on the previous post might be a little overwhelming. If there is a way to turn an AmEx gift card into cash easily, you will earn the reward over and over. Of course, there is no such a perfect method. However, there is a way to do so with a little work and some conditions. The fastest way to turn AmEx gift cards into cash is to sell them on eBay. Look at the picture. 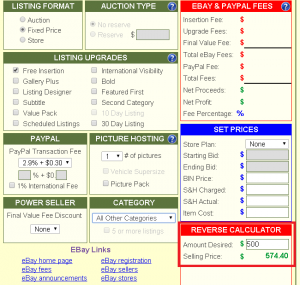 It shows how much fee eBay and PayPal charge you. 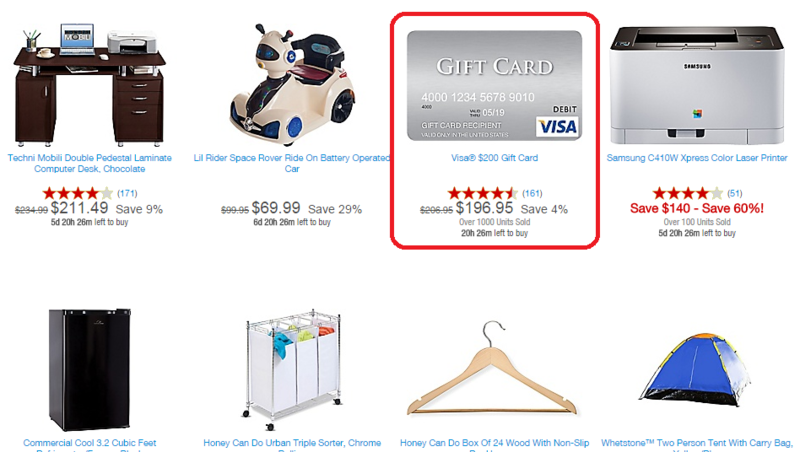 To get $500 by selling $500 AmEx gift card, you have to sell a gift card at the price of $574.40 (plus shipping cost). Obviously, it is a bad deal for eBay buyers. I guess nobody buys it. But what if you sell five $100 gift cards? For $100 gift card, you need to sell it for $115.15. On eBay, some gift cards are very popular. 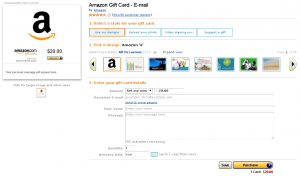 For whatever reasons, some people pay more than face values for those gift cards. Please remember about $3.95 purchase fee on each card when you buy AmEx gift cards, and $115.15 doesn’t include it. 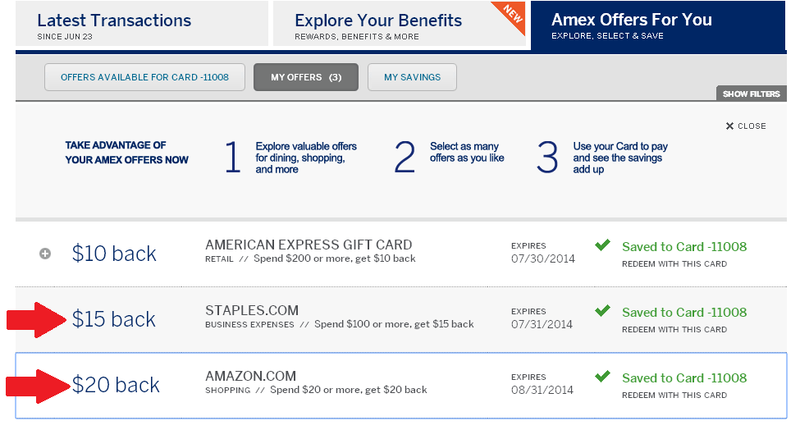 American Express offer free-purchase-fee promotion very often. You can take advantage of the promotion when you sell AmEx gift cards on eBay. 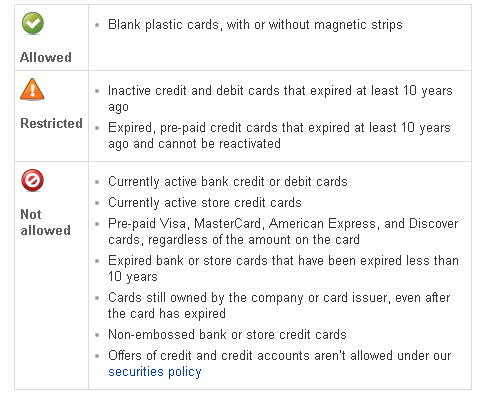 However, actually I have never tried to sell any AmEx gift cards on eBay because of eBay’s gift cards policy. According to the policy, you cannot sell Visa, MasterCard, Discover, or American Express Prepaid cards regardless of the amount on the card. 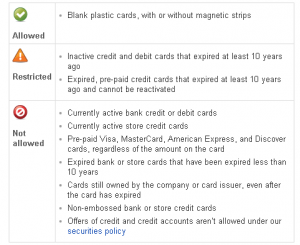 You cannot even sell used (no-value $0) prepaid cards as collectibles if an expiration date on the card is within 10 years. Despite the policy, so many cards are sold on eBay. You rarely see active listings of Visa, MarsterCard, Discover, and AmEx because they are sold quickly. 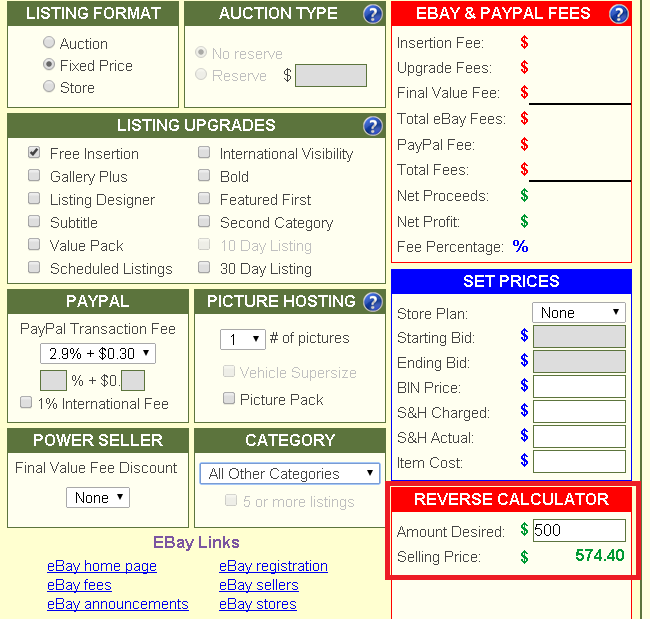 If you click “complete listings” or “sold listings”, you will see a lot. It seems easy to sell $100 AmEx gift card for $115.15, but what if buyers report a charge-back? The items are prohibited by the policy, so I don’t think eBay’s seller protection covers these transactions. I sent a question about it to eBay by email, and I’m waiting for an answer. Until my question is clear, I don’t want to risk losing money by selling AmEx gift cards on eBay. The reason of converting AmEx GCs into Visa GCs is that Visa GCs are much closer to “Cash form” than AmEx GCs. Unlike AmEx GCs, Visa GCs have some features of Debit Card. Depending on stores, you can get cash back at registers. And more conveniently, you can load BlueBird or Serve with Visa GCs, and then pay bills, withdraw cash at ATM, or transfer to your bank account. Now, the cycle is completed. You can buy another AmEx GC. There is one problem, though. That’s Visa GCs charge a purchase fee. Purchase fees vary depending on types and denomination of Visa GCs. You should choose a GC with low percentage fee. There are ways to avoid the purchase fee of Visa GCs. Exactly speaking, you can never avoid a purchase fee, however, by using the following store’s gift cards, a purchase fee are offset. Here are what I have found so far. Both Target.com and Staples.com allow to purchase gift cards with their own gift cards. If you can get these store’s GCs with equal to or more discount than a purchase fee of Visa GCs, you may as well avoid a purchase fee. It is kind of hard to find 6%-discounted Target GCs, but you can always find 3.5%-discounted Staples GCs at Gift Card Granny. This step may take extra time (a week or so for store’s GCs to be delivered). Instead, you don’t lose money in transactions of purchasing Visa GCs. That’s all I can come up with so far. To earn a lot of rewards, you have to spend a lot of money. American Express Gift Card is the perfect choice. Use AmEx GC for everyday’s spending unless your credit card has a better reward, such as Blue Cash Preferred 6% Cash Back at grocery stores and Chase ink 5% Cash Back (5X) at office supply stores. And you can buy Visa GCs to boost up the speed of the cycle. The reward shows up and is available for you to use approximately 30 days later. By keep doing this strategy, you get a steady flow of gas reward. No Longer Purchase Gift Cards with Staples Gift Cards Online? I noticed today (July 25th, 2014), Staples gift cards can’t be used for the purchase of any gift cards at Staples.com. The last order I made was a week ago. I bought one $200 Sears e-gift card. I used five Staples GCs (that had all small amounts) and Chase ink business credit card for the rest. The check-out was smooth, and the e-gift card was delivered a few days later. And today, I tried to reorder, but can’t choose Staples gift card as payment. In check-out page, there are five payment methods: Credit Card, Visa Checkout, Staples Gift Card, Staples Rebate Card, and Pre-Paid Card. However, a check box of Staples Gift Card is dim and not clickable. I tried for Visa gift cards, but it was the same. I couldn’t choose Staples Gift Card as a payment. Next, I added regular items like k-cups and copy papers, but the check box is still not clickable. Then I removed gift cards from a cart. Now I was able to click the check box of Staples Gift Card. It seems that Staples no longer accepts Staples GCs for purchases of any gift cards. I was receiving Staples GCs from Discover credit card reward, and also purchasing at 5% to 7% off price at gift card exchange sites like Cardpool or ABC Gift Card. Discover offers 20% discount when you redeem the reward for Staples GCs while it offers 10% discount for Sears GCs. So, I redeemed for Staples GCs and purchased Sears e-gift cards at Staples.com. It takes time, but I managed to get 20% discounted Sears GCs in this way. The reason I bought Staples GCs at Cardpool or ABC Gift Card was that I wanted to speed up the process of spending American Express Gift Cards. I bought 5% to 7% discounted Staples GCs with AmEx GCs, then purchase Visa GCs at Staples.com. Visa GCs charge a purchase fee, but 5% to 7% discount offsets the fee, even leaves a profit. Once I get Visa GCs, I can reload AmEx Serve at Walmart, and then pay bills or withdraw money to my bank account. Now that Staples GCs can’t buy other gift cards, I should stop ordering Staples GCs. I can continue to buy gift cards with Chase ink credit card, but I should look for another way to spend down AmEx GCs. I applied for Chase business credit card called “ink Cash” in June 2013. The card has MasterCard logo on it. Almost at the same time, Chase changed the version of ink credit card from MasterCard to Visa. If you applied for ink credit card after July 2013, your card is probably Visa version. The best benefit of ink credit cards is that you can earn 5% cash back or 5x reward points on the purchase at office supply stores, such as Staples, Office Depot, and Office Max. 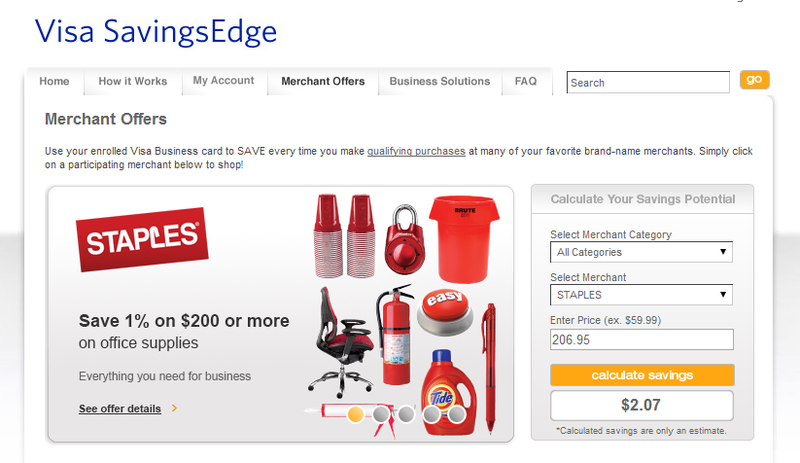 And Staples is one of merchants for another cash back program called Visa SavingsEdge. You can get 1% cash back on purchases of $200 or more at Staples, both in store and online. When you buy $200 Visa or MasterCard gift card at Staples with a Visa-version ink credit card, you will get 1% cash back in addition to 5% cash back or 5x reward points from Chase Ultimate Reward. This offer is available through 12/31/2014. I couldn’t get this offer because my ink credit card is MasterCard version. To get this offer, I considered applying another ink credit card so I would get a Visa-version ink. However, in the last six months, I applied many credit cards and wanted to recover my credit score. So, I headed to a Chase bank and asked if they could change my ink card from MasterCard to Visa without affecting my credit score. After a bank teller had spoken on the phone with a credit company for a few minutes, the teller told me I could and would receive a new card (Visa-version) by mail in 7 to 10 business days. Ten days later, I received a new one. Before I received the new card, Chase had transferred my account, balance, etc to the new card, so I couldn’t use my old ink (MasterCard-version) for several days. If you switch your card from MasterCard to Visa, you should go shopping before asking Chase. Card numbers are changed, and expiration date is one year extended. A color of ink Cash credit card is sliver. MasterCard logo on ink card was red and orange, while Visa’s is shiny silver. Now my ink Cash credit card looks very plain and dull. There are a lot more stores’ gift cards being sold at Staples.com. The thing is that they are sold online, and a transaction is made within Staples. Because of these facts, you can get a reward from online shopping portal. In addition, if you have Chase Ink Cash business credit cards (or Ink Bold/Plus), you will get another 5% cash back (or 5x points) on the purchase at office supply stores. You don’t have to use Ultimate Rewards Mall, which give only 2% (or 2X). No matter which payment method you take, you can choose the best online portal. 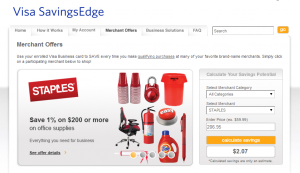 For Staples, it is ShopDiscover. Let’s see an example of $200 Visa gift card. The card charges $6.95 activation fee, and shipping is free. In the next statement, you will get $10 from ShopDiscover and another $10 (or 10,000pt) from Chase. So, the total of cash back will cover whole activation fee and even give you a $13.05 profit! Please keep in mind, it’s important to browse available coupons every time you shop online. It has been my habit to try online coupons before a checkout. This a good example of why you should get into the habit. I found this coupons in a coupon site. 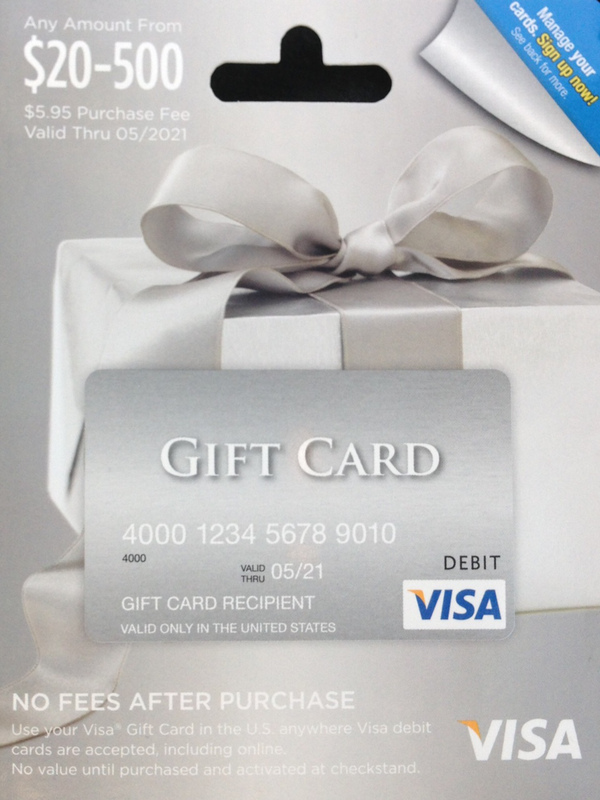 Usually, a purchase of gift cards are not eligible for coupons. So, I only tried to apply the coupon without much expectation. As a result, it went through. Unbelievable, I just bought $200 Visa gift card for $191.95, and later I will receive $20 cash back! This Visa gift card is issued by MetaBank. There is no way to obtain PIN for ATM access to withdraw cash. Even so, you can use it anywhere in the U.S. that accept Visa debit/credit card. You can buy everyday items or even go back to Staples.com and make a purchase of other gift cards. If you buy $200 Home Depot e-gift card (no shipping, tax, or purchase fee), you will get 5% cash back from ShopDiscover again. (e-gift cards may not be eligible for cash back from online portal. I’ve done some tests and the result is here.) 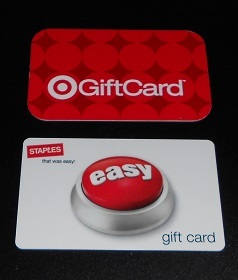 Staples has also many other gift cards available only in store, such as amazon, BP, Shell, etc. If you use Ink Cash credit card, you can get 5% cash back on the purchase of any gift cards in store. As you see, not only eBay or Cardpools, but Staples is also one of the best places to buy gift cards both in store and online.